If you’re searching for the three-dimensional look of natural stone cladding, stacked stone, stone panels and stone veneers look no further than Norstone Rock Panels, a 100% natural stone cladding system which is ideal for both interior and exterior stone cladding use. The stone cladding's machine cut, precision modular form ensures quick, easy and economical installation. 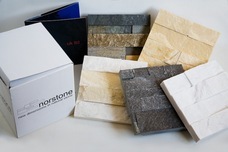 Norstone is known throughout France and the world for its interior and exterior stone cladding panels. Our attractive and unique stone cladding designs combine a natural feel with a classical elegance and an ultra-modern look that sets Norstone apart from more traditional wall and panel products. Norstone’s unique rock panel system has been installed in some of the world’s most prestigious projects and is often specified by architects and designers. The ease and speed of installation combined with natural stone cladding of the highest quality make Norstone the stone cladding of choice of architects, designers and builders in France and all over the world.